Your garage door opener is built to stand the test of time, but the light bulbs it uses are not. Depending on the type of light bulb you chose there are going to be pros and cons to consider. Let's take a moment to discuss your options. This is going to be the most cost efficient option and the most logical choice since your garage door opener comes with incandescent light bulbs in the box. Most people are starting to move away from incandescent bulbs due to their energy usage and short life. Garage door opens vibrate a lot while in use which can cause incandescent lights to die early. To address this issue, it's recommended to use a shatter-resistant rough service incandescent light bulb. Their thicker filaments will make them hold up better to the vibrations while it's in service and if the bulb should happen to fall out of the socket there's a low likelihood that it will break. Using a CFL isn't recommended with a garage door opener but you can do so and see if it works. The issue is that CFL bulbs can create interference between the remote and the opener. The electronics in a compact fluorescent bulb can different from one brand to the next so it may take some trial and error to find out what works and what doesn't. If you have some extra CFL light bulbs around the house it might be worthwhile to try and see if what you have will work. Otherwise, it might be best to stick with using incandescent bulbs. 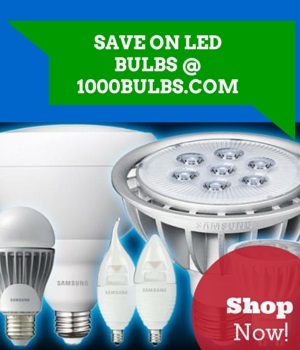 LED light bulbs can be a great long lasting alternative for use in a garage door opener. You have to be careful which one you use since it's possible to have the same interference issues that some experience with CFL bulbs. Thankfully, garage opener manufacturers are beginning to test LED bulbs on behalf of their customers and create compatibility lists. LiftMaster, one of the most popular brands in the market, has create a list which you can find here. One of the LED bulbs on the list is this 40W equal soft white LED bulb from Cree. At $9.97, the price may seem steep, but with a rating of 25,000 life hours there's a chance it will last you more than a decade. Have any questions or suggestions? Feel free to leave them in a comment below or on Facebook, Twitter, Google Plus, LinkedIn, or Pinterest.